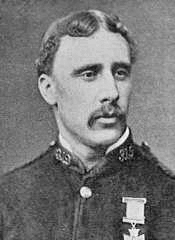 Frederick Hitch, VC (29 November 1856 – 6 January 1913) was an English recipient of the Victoria Cross for his actions at the Battle of Rorke's Drift, the highest and most prestigious award for gallantry in the face of the enemy that can be awarded to British and Commonwealth forces. War Office, May 2, 1879. It was chiefly due to the courageous conduct of these men that communication with the hospital was kept up at all. Holding together at all costs a most dangerous post, raked in reverse by the enemy's fire from the hill, they were both severely wounded, but their determined conduct enabled the patients to be withdrawn from the hospital, and when incapacitated by their wounds from fighting, they continued, as soon as their wounds had been dressed, to serve out ammunition to their comrades during the night. The soldiers were assisted in passing out ammunition by Padre George Smith. Hitch was severely wounded during the action, and was still in the Royal Victoria Military Hospital, Netley, Southampton when he received his medal from Queen Victoria. He was one of the eleven recipients of the VC awarded for their part in the battle. Hitch's wounds were so severe that they led to his discharge from service. He then moved from job to job, unable to perform manual work due to the damage to his arm he had received during the battle. He married in 1883, but reportedly found life difficult living on his disability pension from the government, which amounted to just £10 a year. In 1901, whilst climbing a ladder he suffered a fall. When he awoke in hospital his VC, which he always wore, had been stolen. Another version is that he was given a position in Whitehall as a ceremonial guard and his VC was cut off his chest and he was knocked to the ground. In this version his VC was replaced by the regiment. His missing VC later reappeared at auction and was bought by Hitch's descendants for £85. Both the original and the replacement are in the regimental museum. Blue Plaque marking the home of Private Frederick Hitch V.C. at 62 Cranbrook Road, Turnham Green, London. Forced to pay for a new one from his own pocket, Hitch also lost his job soon afterwards when he was accused of faking the fall to hide the fact that he had sold his medal to raise funds. This has never been proven. Hitch had eight children, and managed to land a steady job as driver of a smart horse-drawn cab (pulled by his own pair of horses), which he later exchanged for a motor taxi cab. This provided him with a comfortable income for some years. By the time of his death in 1913 he was living alone in Chiswick, West London at 62 Cranbrook Road where he is commemorated with a blue plaque from English Heritage. He collapsed and died at his home whilst talking to a neighbour. He was buried in St Nicholas' churchyard in Chiswick, with full military honours. His funeral was attended by a large number of London 'cabbies' and he is commemorated by the Fred Hitch Gallantry Award for cab drivers. He is buried in the centre of the churchyard of St Nicholas Church, Chiswick. The grave is difficult to miss since it is more of a monument than a grave, featuring a helmet on top. Some of the funds to build this memorial may have come from the proceeds of a special showing of the world's first all-colour feature film. Just before the newly-built Picture House cinema at 165 Oxford Street opened to the public on 24 January 1913 to show the The Miracle, the film's American producer, Joseph Menchen, donated the proceeds of a pre-opening matinée performance on 22 January (the anniversary of the battle) towards a fund for a fitting memorial to Frederick Hitch. His Victoria Cross is displayed at the South Wales Borderers Museum, Brecon, Powys, Wales.